Foothill-De Anza Community College District Chancellor Judy Miner announced Thursday that she is recommending Thuy Thi Nguyen as the next president of Foothill College. Pending approval May 2 by the district Board of Trustees, Nguyen would begin work on July 1. Currently serving as interim general counsel for the California Community Colleges Chancellor’s Office since July 2015, Nguyen has spent the past 12 years working for community colleges and community college students. She is on loan to the Chancellor’s Office from the Peralta Community College District, where she had worked for more than a decade. 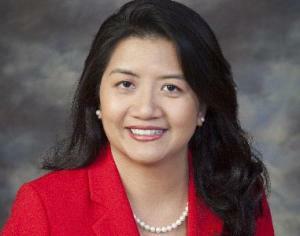 Nguyen will take her place among a small group of Asian American college presidents and is believed to be the first Vietnamese American community college president in California. Across the country, only 1.5 percent of presidents at two- and four-year colleges and universities are Asian and Pacific Island Americans, according to the most recent published data from the American Council on Education. Nguyen’s is a classic American success story. When she was 3, she and her family joined the wave of “boat people” who fled Vietnam after the end of the war. They drifted in the Pacific Ocean on a rickety boat for more than 20 days before a commercial ship rescued them and took them to a refugee camp in Japan. Eventually, the family relocated to Wichita, Kansas, then moved to the warmer climate of New Orleans. When she was 14, the family settled in the Bay Area, living in a low-income housing apartment in Oakland. Nguyen attended a predominantly African American and Latino school, Castlemont High, where she embarked on a path of community leadership and service. At Castlemont, she served as a student representative on the Oakland Unified School District’s Board of Directors, cadet colonel brigade commander in the Army Junior Reserve Officer Training Corps, and valedictorian of her class. Upon graduation, the mayor of Oakland declared June 23, 1993 “Thuy Thi Nguyen Day” recognizing her community service. She earned a bachelor’s degree in philosophy at Yale University, then entered the UCLA School of Law. Nguyen said she was inspired to pursue a legal career so that she could play a part in correcting social injustice, having seen firsthand the contrast between the “haves” and “have nots” in society. While still in law school she was selected to receive a Paul and Daisy Soros for New Americans Fellowship, which provides opportunities for new immigrants to achieve leadership positions in their chosen field and achieve the American dream. Nguyen was part of the inaugural class in the law school’s public interest law and policy program and earned a juris doctor degree. Nguyen started her career at a small law firm in Emeryville, providing legal assistance to school districts in areas such as desegregation, student discipline, bilingual education and employment. She later worked as a field representative for California Assembly Majority Leader Wilma Chan. In 2003, the Peralta Community College District appointed her interim general counsel, and soon made the appointment permanent. As general counsel, she represented the interests of the district and its four colleges, Laney College, Merritt College, College of Alameda and Berkeley City College. Over the years she performed additional duties for the district as acting vice chancellor for human resources and districtwide strategic planning manager. Before her assignment in the California Community Colleges Chancellor’s Office, Nguyen took a leave from Peralta to serve for six months as interim president and chief executive officer of the Community College League of California, heading the chief advocacy organization for California community colleges. In announcing her selection, Miner cited two projects that she said illustrate Nguyen’s ability to translate passion and vision into action. One is the law school pathways project Nguyen created to diversify the legal profession. As a volunteer on the State Bar of California’s Council on Access and Fairness, Nguyen brought together law schools, universities and community colleges to develop a program that gives a diverse population of students a clear pathway to law school. The 2+2+3 Community Colleges Pathway to Law School launched in 2014 and today includes six California law schools, six undergraduate universities, 29 community colleges and 16 high school law academies and is viewed as a model. Another example that Miner pointed to was the creativity Nguyen brought to her general counsel role in the state Chancellor’s Office. As overseer of equal employment opportunity plans for 72 community college districts and 113 colleges, Nguyen led the move to an innovative funding approach that encourages community colleges to assess and strengthen their efforts in equal employment opportunity. She’s also organized regional training workshops covering such topics as why diversity in hiring matters and how to address unconscious bias, highlighting evidence that a diverse faculty helps close the student achievement gap. Nguyen has deep connections in the East Bay and is well known in the local Vietnamese community. She co-published a book, “25 Vietnamese Americans in 25 Years,” showcasing the contributions of 25 distinguished Vietnamese Americans to American society to mark the anniversary of the fall of Saigon. The book is archived in the Library of Congress and available at the Viet Museum in San Jose and many public and university libraries across the country. Nguyen worked as an adjunct instructor teaching education law for several years at what is now California State University, East Bay. She currently serves as board president of the Marcus Foster Education Institute, which promotes excellence and educational opportunity in Oakland public schools. In 2011, the Vietnamese American Bar Association of Northern California gave her its Trailblazer Award and in 2012, the Minority Bar Coalition presented her with its Unity Award. She is the founding president of the Castlemont High School Alumni Association and has been inducted into the school’s Alumni Hall of Fame. Nguyen is a Rotarian and lives with her husband and two children in Castro Valley. She places on the salary schedule for executive compensation at $188,878. Nguyen’s appointment will conclude a nationwide search for Foothill’s top administrative post that began last fall with the assistance of the national recruiting firm Community College Search Services. Foothill College serves approximately 13,000 students annually. The Chronicle of Higher Education recently identified it as the top two-year public college in the nation for graduating first-time, degree-seeking students within three years.